Looking for vegan & veg-friendly options for breakfast and brunch? You’ve come to the right place! Here you will find complete listings of the best breakfast & brunch offerings from your favourite Vegetarian Directory businesses. From healthy, energy-packed granolas to decadent scrambles with “sausage” and “bacon”, this Brunch Guide’s got something for everyone. “It’s the most important meal of the day. From our trend-setting chia seed puddings to filling and hearty overnight oats, start your morning with the right fuel to take on the day.” Find options like chia pudding and overnight oats for a healthy, energy-inducing start to your day. Find awesome veg & vegan brunch options at Berkeley North, including the Veg Taco with a Tumeric & Coconut Taco, Pickled Veg, Microgreens & Peanut Sauce and the Granola Bowl with Housemade Granola, Yogurt, Pomegranate and Pineapple, as well as a variety of sides and brunch cocktails. “The Bleeding Carrot serves up delicious vegetarian, vegan and gluten-free cuisine with thoughtful presentation at an affordable price. Our juice bar provides delicious smoothies that pack a healthy punch to help you start the day and keep you going! But hey . . . we also like to indulge ourselves too, so when you are here be sure to try our delicious treats and baked goods made daily!” Breakfast every day before 11am, including oatmeal, and breakfast sandwiches and wraps. Check out Butler’s Pantry’s new Middle Eastern Brunch menu! There are tons of vegetarian & vegan options. “Our Syrian Style Middle Eastern Brunch is starting on Saturday 13 May 2017. Initially we will do it every Saturday and if you want we will do it on Sundays as well. This meal is meant to be shared, so do invite a friend and come over. SAHTAIN (Bon Appetit)! When: Starts 10am every Saturday. This Beaches hotspot for vegan fare and live music features all vegetarian brunch menu with options such as the the Grilled Breakfast Quesadilla with Strawberries and Blueberries, Vegan Cream Cheese and Maple Syrup. This is the place to be for vegan brunch. Amazing, mouth-watering options include classics like the All-Day Breakfast (available on the regular menu, 7-days a week!) with your choice of Cornmeal Waffles or Oatmeal Blueberry Pancakes, served with Tofu Scramble (GF) and Home Fries (GF) (or skip the waffles and pancakes for more scramble and home fries for the fully GF version), Huevos Rancheros with 2 fried corn tortillas topped with tofu scramble, refried black beans, lettuce, salsa and Daiya cheese. There are also sweet options such as vegan Caramelized Banana & Chocolate Chip Pancakes, Cinnamon Buns, plus tons of extras and sides such as their Deep Fried Mac ‘n Cheese Balls. In addition to a full juice & smoothie bar, Cruda Cafe serves up raw, vegan breakfast options like Raw Vegan Pancakes with seasonal fruit, agave nectar or maple syrup, topped with coconut cashew banana cream, OR their Raw Sprouted Granola with seasonal fruit, almond milk and agave. Toronto Veg Card holders save 10%! Located in St. Lawrence Market. Having been open for just over a couple of years, D-Beastro’s vegan brunch has become renowned. With delicious, filling options like the Deluxe Breakfast with housemade sausage, tofu scramble, home fries, toast and fresh fruit (also available in a gluten-free option), the Pizza Grilled Cheese with pesto, Daiya mozzarella, and tomato sauce, and their famous Red Velvet Waffle Stix served with frosting and maple syrup. And save room for dessert- Toronto Veg Card holders save 10% on fresh baked goods! An inspired plant-based brunch menu is served in-house every Sunday – reservations accepted & recommended. You have to check out Doug’s plant-based eggs, yolk and all- guaranteed you’ve never had vegan eggs like this. Try the Vegan Benedict with choice of gluten-free or sprouted grain english muffin, crisp cornmeal and fennel crusted tomato, herbed white wine and garlic spinach, seared smoky sprouted tofu, runny soft poached vegan egg yolk and hollandaise sauce, or for a sweet option, the Coconut Crusted French Toast with Doug’s signature gluten-free french toast, warm maple syrup, vanilla maple yoso coconut yogurt drizzle, ground ceylon cinnamon and tempeh bacon. including cold pressed juices, salad bowls, smoothies, smoothie & breakfast bowls, and vegan/gluten free snacks. Free Times Café offers classic brunch menu with vegetarian options. There’s an a la carte brunch on Saturdays, and their famous brunch buffet every Sunday with Authentic Jewish foods and live Klezmer & Yiddish music. 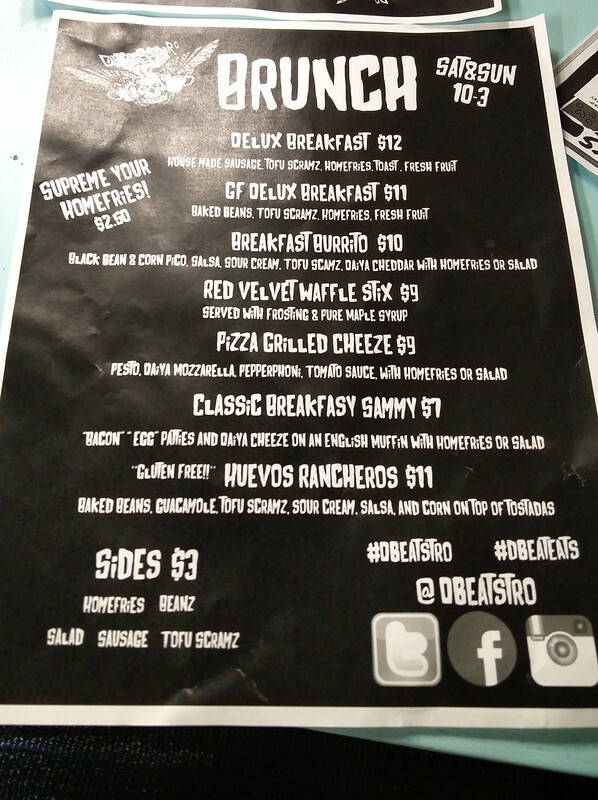 Fresh offers a weekend brunch menu. Try gluten free pancakes available in many flavours such as banana nut and blueberry almond (which you can also have as a platter served with tofu scramble, and your choice of vegan sausage or tempeh bacon, served with Earth Balance butter and pure maple syrup. There’s also the new Breakfast Tacos and the Tex Mex scramble. The Junction location of Grasshopper offers every day brunch options! Until 4pm every day, enjoy Blueberry Chia Pancakes with blueberry compote and coconut whipped cream, or the amazing Chick-un & Waffles- southern style quinoa crusted chick-un over our house made basil and oregano waffle. There are also all-day (beyond 4pm) brunch options. Toronto Veg Card holders save 5% ($15 min. order)! Every day is a great day for brunch at Hibiscus! Their menu, including sweet and savoury vegetarian and vegan crepes, as well as soups, salads and vegan desserts and ice cream makes them a perfect brunch spot! Try amazing options like the Vegan Mozzarella Tomato Basil Spinach Mushroom Crepe, or the Homemade Vegan Dulce De Leche Kiwi (pictured). Hibiscus is entirely gluten-free. One of Toronto’s most renowned vegan restaurants and sources for plant-based comfort foods! Their hearty, filling and delicious brunch options will not disappoint. Try the Tofu Rancheros, PB & Banana French Toast, and their famous UnChicken & Waffles. Many gluten-free options available. Hotel Gelato has a variety of veg & vegan options on their breakfast and brunch menus. The daily soup is always vegan! There’s also an extensive cocktail and wine list. If you haven’t been to Karine’s before, you’ve been missing out on Toronto’s hidden gem for vegan, gluten-free, all-day breakfast. The menu offers a huge selection of waffles, pancakes, crepes, and french toast with many different toppings choices. There’s also savoury choices like Vegan tofu Benedict with salad or fries ( try the garlic fries! ), and the Vegan Goodness (scrambled organic tofu) with salad or fries. Everything is served in generous portions with loads of fresh fruit. Kupfert & Kim is a plant-based, quick-service restaurant. We make delicious, minimally-processed food that is awesome for humans, animals and our planet. Visit one of their to-go locations, or their full-service restaurant on Spadina for All-Day Breakfasts which include Waffles, Oats, and Breakfast Bowls! When: All day! Each locations may have different hours, click here to view each location’s hours of operation. Drop by Lettuce Love Cafe every Saturday and Sunday for weekend brunch, including pancakes, a classic breakfast with tofu scramble and tempeh bacon, and breakfast bowls. Planta serves up some of Toronto’s most delicious and unique plant-based fare, and offers a Sunday brunch with smoothies, cold pressed juices, and small and large plates. Options include Cinnamon Buns, Cauliflower Tots, Banana Pancakes, and the Land Lox Platter (smoked carrots, capers, bagel, cream cheese), as well as pizza and salads. A plant-based restaurant and juice bar, Plant Matter Kitchen serves organic, delicious, plant-based meals with no artificial ingredients or additives. Brunch menu includes delicious options such as waffles, breakfast burritos, omelettes, tofu scramble and more. Rise Above is an all vegan restaurant and bakery, located in the heart of downtown St. Catharines, specializing in comfort foods, healthy choices, and fresh baked desserts. The brunch menu includes smoothie bowls, French Toast and Sausage, and Avocado Benedict, and weekly changing Pancake specials (Peach Cobbler pancakes pictured) with sides ranging from baked beans & roasted potatoes, to granola and fruit salad. The Steady’s homemade brunch features signature vegan options, award-winning vegan donuts, brunch cocktails and a full espresso menu. Toronto Veg Card holders save 10% on brunch! Try the Vegan Eggs Benny or the Tofu Scramble. “Everything we do is about MAXIMIZING NUTRITION for OPTIMUM HEALTH by using superfoods as well as organic, natural and whole food ingredients.” Try Thrive’s brunch options from classic, filling breakfasts to their Chocolate Almond Pancakes (pictured), at either their Lakeshore location, or their new downtown College St. location. All egg dishes can be substituted with tofu scramble, and gluten-free options available. Posted April 15, 2017 by Directory Coordinator. Filed under Food and Restaurant News, News, Restaurant Guides, Veg Directory Updates.